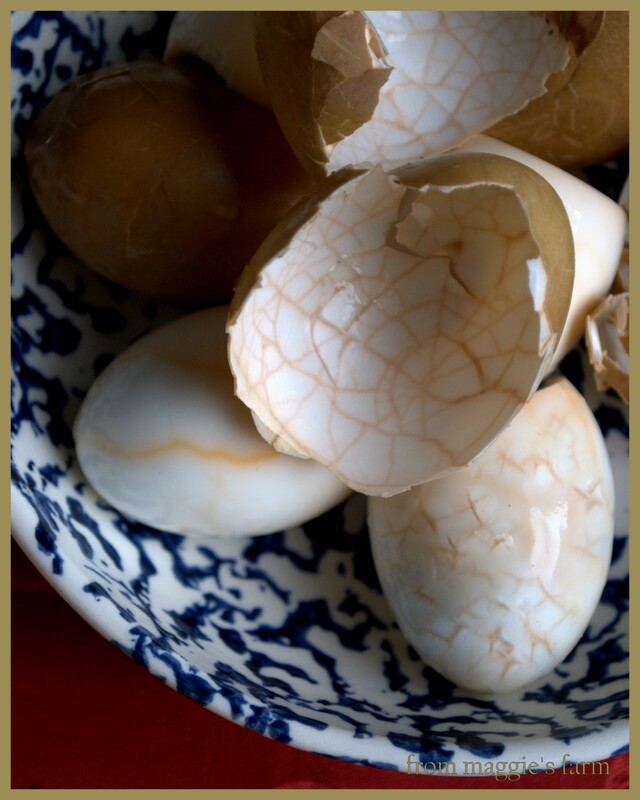 Chinese tea eggs are a common snack, found in street-side stalls, convenient stores, and home kitchens all over the country. They are a popular and economical snack, eaten warm or cold, at a table, or on the go. 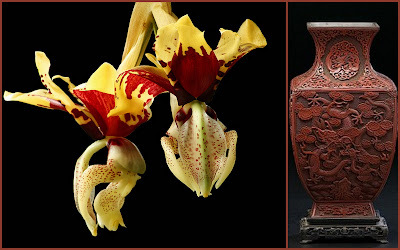 They are especially popular, here in America, and abroad, during the Chinese New Year celebration, signifying wealth, prosperity, and fertility. They are quite simple to make. 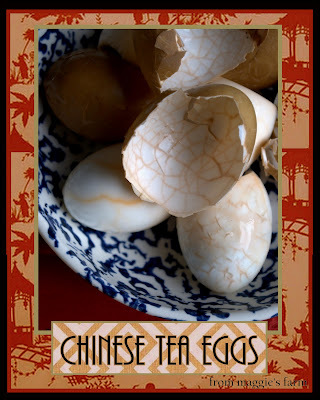 Tea eggs are traditionally made with Pu-erh tea, and are simmered, after boiling, in the seasoned tea for a few hours. This makes an egg with a yolk cooked harder than we prefer, and with a bit of a musty taste, due to the type of tea. 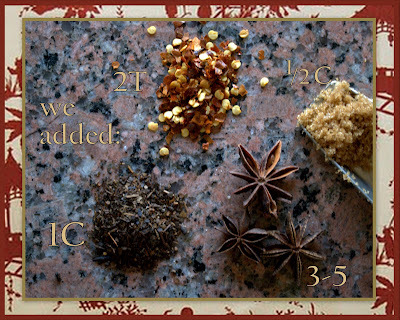 We wanted to play around with the recipe, and put our own touch on it, so we took a few liberties with spice mixture and tea variety, as well as adjusting cooking times and methods. We even chose to use a few duck eggs in the mix, and they had the richest yolks of all, though they did not marble as well, due to their thicker membranes. Our eggs did come out differently, and we were delighted with the results--so much so that we ate them all in one sitting. The marbling was less intense, and the flavor was a little brighter, and less salty. I think you'll like them. If you can keep from gobbling them all in one sitting, try a simple egg salad (we used only eggs and a light mayonnaise, seasoned with black pepper) for a fresh, new twist on an old standby. 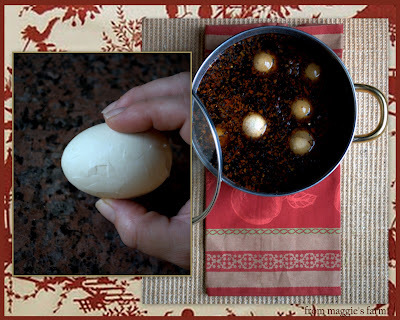 For 6 eggs, bring a pot of water, large enough for eggs to float in freely to a boil. Add eggs and return to boil. Time for 8 minutes, thereafter. (Is this method new to you? Wait 'till you see how easy it makes these eggs to peel. My husband taught me this and I've used it to boil, and peel, perfect eggs every time, since.) 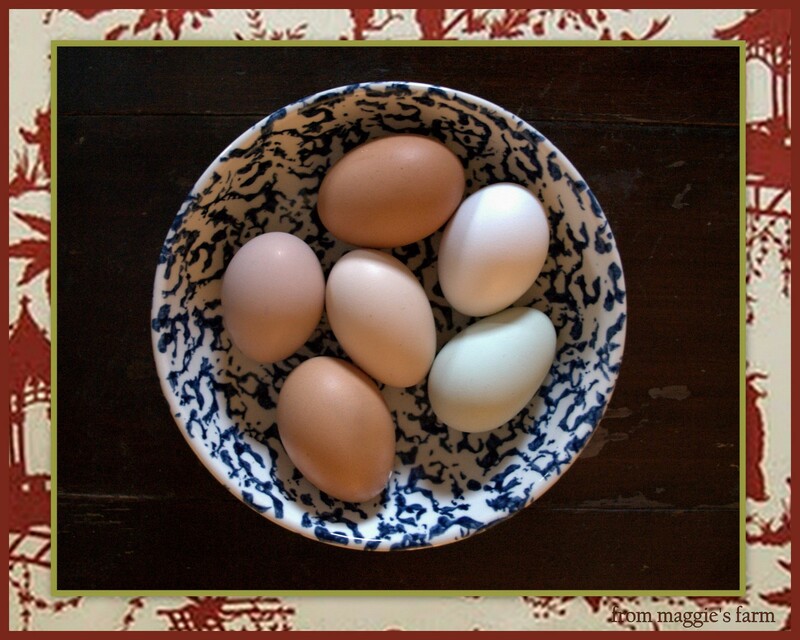 Remove eggs and place under cold running water until cool enough to handle. Return saucepan of water to a simmer. Add 1/4-1/2 cup soy sauce, 1 cup of Thai tea leaves (or 4 bags black tea, for traditional version), 2T cracked red pepper, 1/2c brown sugar, and 3-5 star anise. Crack eggs on a hard surface, until well-crackled all over. The more you crack, the more intricate the design will be. Gently place eggs into simmering liquid, and remove from burner. Let sit until pan comes to room temperature, and refrigerate. Allow eggs to soak in the liquid overnight, or as long as 1-2 days for stronger flavor and effect. 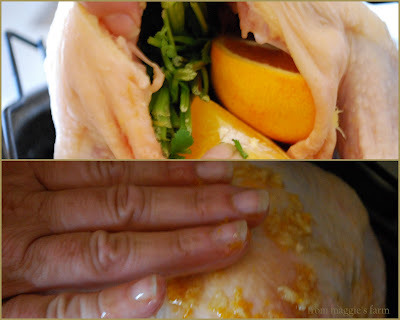 Remove from liquid, wipe off, and carefully peel. 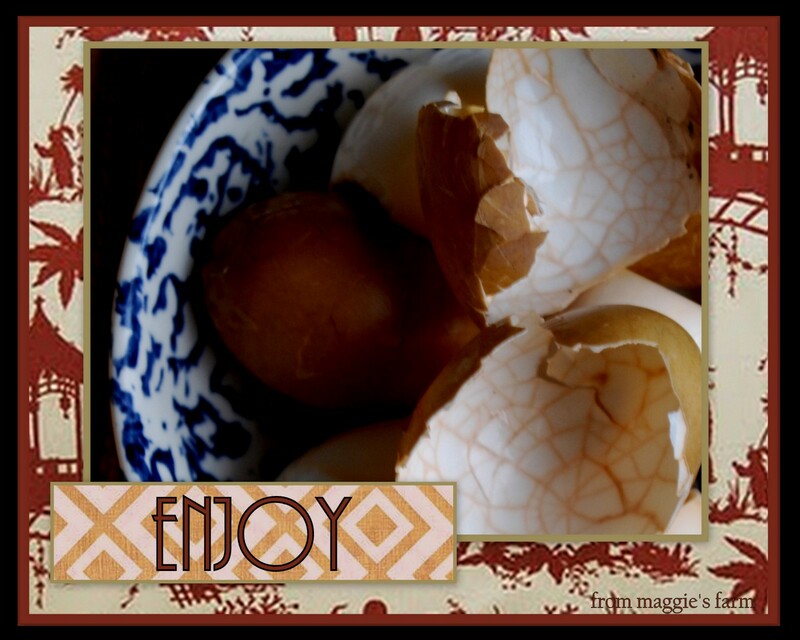 Enjoy your little eggy treasures immediately, or for those of you with more discipline, they can be refrigerated for 5-7 days. If you're raising your own chickens, (and if you are, you probably already know this) using your freshest eggs will do nothing more than cause you to pull most of your hair out when attempting to peel. Eggs that are at least a week or two old will make the job so much more pleasant. 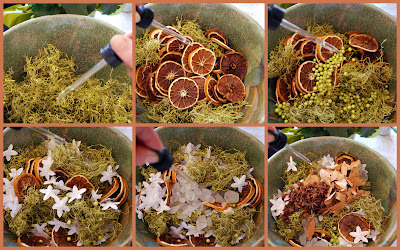 Thai tea leaves, while a delicious substitution that we will adopt, have an orange hue, and makes a tea egg more delicately patterned, as you can see in the pictures. Black tea will yield a much darker pattern, if you so desire. 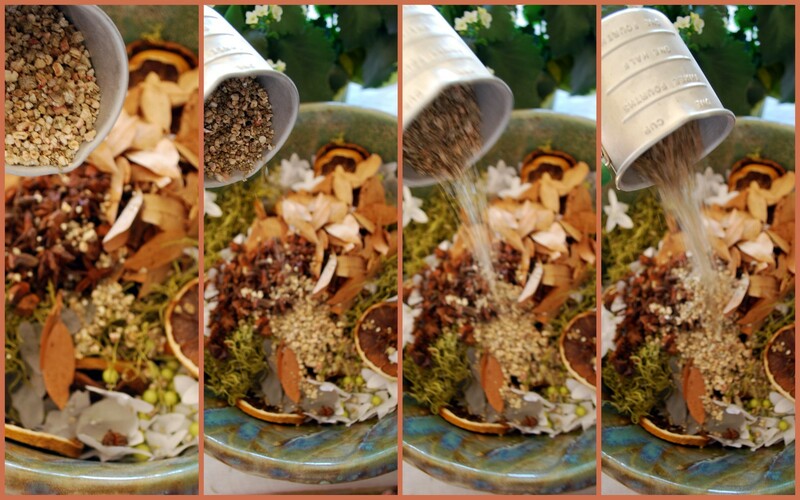 Play around with the seasonings to get your best flavor. 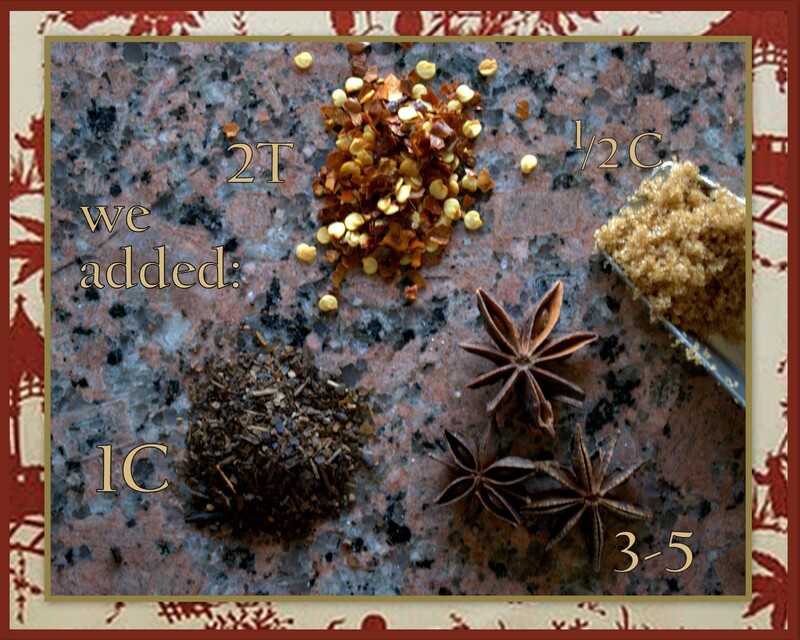 See links below for traditional spices, and methods, used. 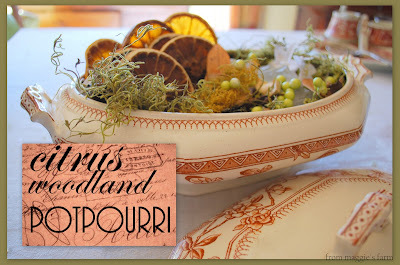 I think I may have mentioned before just how much I love antiquing. If I haven't, I do. In fact I'm sure you've noticed a few 'finds' in pictures all over this weblog. My friend Susie, a dealer of beautiful antiques, will agree, however, that I am cheap. I mean I know the value of these things. I've been doing this for a year or two (like about 40 years, if you count the years I spent tagging along with my mother), so the prices come as no surprise to me. And these little treasures are worth every penny. It's just that I will likely always have that salad-days-single-mom-student mindset, even if those days have passed (mostly)--if you really want something beautiful, and it's out of your range, get the chipped or worn or cracked version, and turn that side to the wall. No one'll be the wiser and you will, indeed, have something beautiful. And that's the way I am. 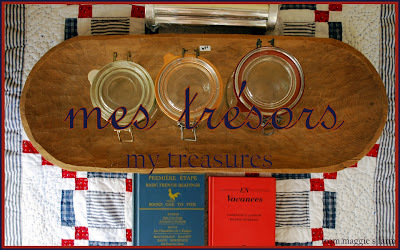 I am like the Olympian crossing the finish line when I find a good thing at a great price. Now, please don't come by the house and start turning things around to find the flaws, especially the homekeeper herself. You will invariably find one (or a dozen). But It'll be the most decorative chip you've ever seen, and it will have been obtained at less than half the non-flawed price. Naturally, a thrift store, well that's a great place for me. 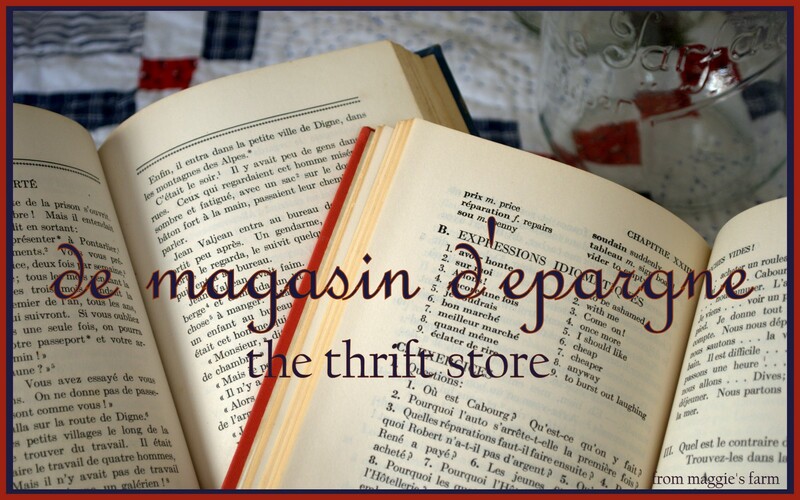 Because you have to really dig to find a jewel at a thrift store. And it's all just a little cheaper. Less expensive, that is. I think of the thrift store as the country cousin of the more urbane antique store. So, no surprise that I should find myself, early Saturday morning, waiting at the door for the the local thrift store to open. imagining the previous owners, as I scavenge through their leftovers. " Now, remember, I live in a small town, Burnet, outside of a big city, Austin. And, really, I live outside of that small town. I live in the proverbial sticks. Our small town doesn't have a lot, but we are filthy rich in Mexican restaurants and antique stores. And I am a regular at both. In fact, before we found our church home, the only friends I had in town were shopkeepers and busboys. In my experience, it's not all that easy to fit in in a small town, unless you've lived there a long time. Could be the hipster glasses I sport, the Chuck Taylor's, that I insist on eating with chopsticks, even though there are plenty of forks to be had, at that one Thai restaurant (that used to be inside the Shell station before they built that wall), I'm learning French, when clearly, Spanish is the most common second language in these parts and the only person that speaks French is my French instructor, there was that time when I nearly shut down the entire grocery store when I asked for prosciutto, I play opera that blares from my car like I'm trying to MUZAK the entire town square, We load hay and feed into a convertible instead of a truck (the most popular in town of which is the size of a small home). I know it. You don't have to say it. I'm a little eccentric. I'm that kind of odd that a big city absorbs. Not so much in a small town. But lately, I've been overjoyed to find friends that chuckle at, and love me, just as I am. Thank you my friends! We have a fancy schmancy resale shop that has beautiful clothes for those who are approximately half my size. A 'charity store' up the road that's really just someone's cover for collecting free cr#p, then littering the entire parking lot with it in such a way as to be an eyesore from just about any direction you enter that town. The nicest lady that owns a lovely gift shop on the square. And several great antique stores in the town, proper. 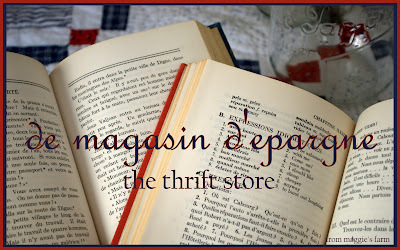 in these parts and the only person that speaks French is my French instructor..."
We have one really nice library, and that one really nice library has a thrift store. 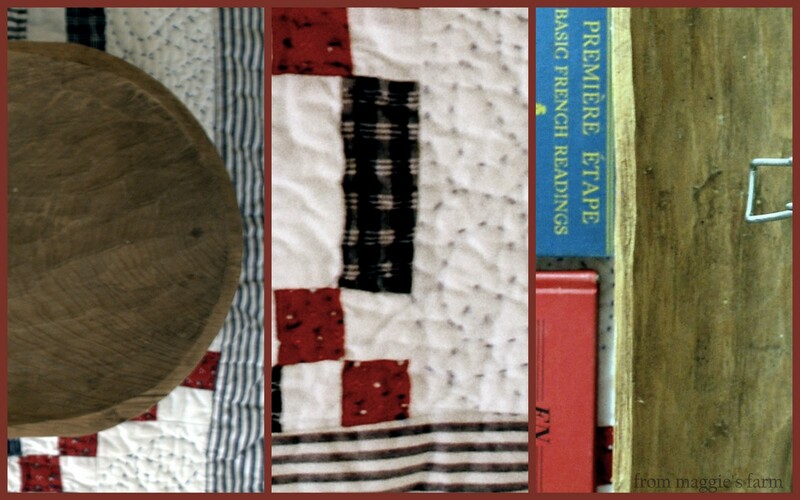 No musty, dusty thrift store smell, everything clean and laundered and pressed. Lovely volunteers to assist shoppers with questions, and allow others, like me, to roam in quiet contemplation. It's a fun way to start the weekend, scavenging through the discards of unknown people's lives. The things they consider not even valuable enough to sell, or perhaps the things they believe to be more valuable than they are--'Just can't throw that away, I'll give it to charity'. I spend a great deal of time thinking about those people, imagining the previous owners, as I scavenge through their leftovers. I have a system. I hit the kitchenware first. I look for anything old. Here, chipped, cracked or rusted will not do. I'm going to use these things, after a good washing. And I always find really cool stuff. Lots of treasures go in the cart. Gold mine today! "Lots of treasures go in the cart. Gold mine today! " Next, 'home decorating'. A plethora of woodgrain-like laminate here. Moire taffeta drapes. Lots of mauve and dusty blue. Hearts and ducks. Keep moving. Home office--never know when you might find some crazy Mad Men-like desk accessory. Nothing today. Moving along. Underpinnings. No. Just no. I draw the line at second-hand underpinnings. Shoes? Well.....okay, no. Chotzkes. Nothing I need. I have enough. Ceramic teddy bears. No. Then there's the clothes. This store is mostly clothes. I check every rack. No to polyester. No to elastic waistbands. Well, maybe? No. No to rhinestones. No to animal print (enough already with the animal print!) Dresses? It looks like my friend, Lisa, has already been here. Nothing good left. Several beautifully starched blouses, so I go through them quickly by doing what I do anywhere; slip my right arm in. No need to look further if that right arm is tight. So, no. I have the upper arms of a sumo wrestler. I hit the menswear. Where are all these tiny people hiding in Burnet? No. no. no. No clothes. I don't know who I was kidding, anyway. I'm so picky about clothes. "Here, chipped, cracked or rusted will not do. I'm going to use these things ..."
Here is the sum total of what 23 dollars plus change will getcha on a Saturday morning at the Burnet Library Thrift Store. my foray through the Burnet Library Thrift Store!? 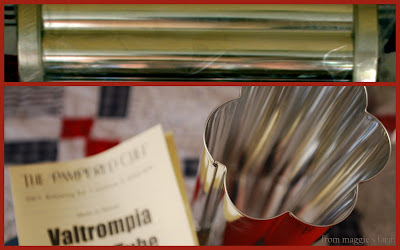 From Top, a Pampered Chef bread tube, new, in all original packaging, retail: $23. My price? $4. !! Middle: Gigantic wooden bread basket. $6. !! 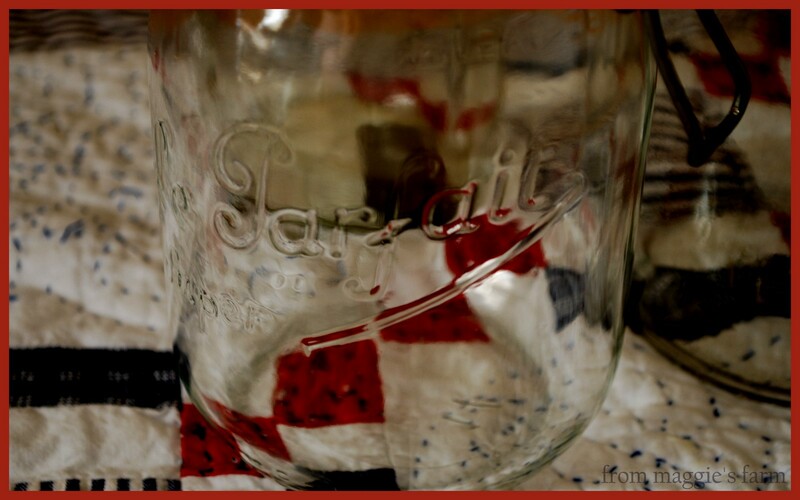 !, French Baling Wire Canning Jars, total--less than $4 for all 3. !!!! 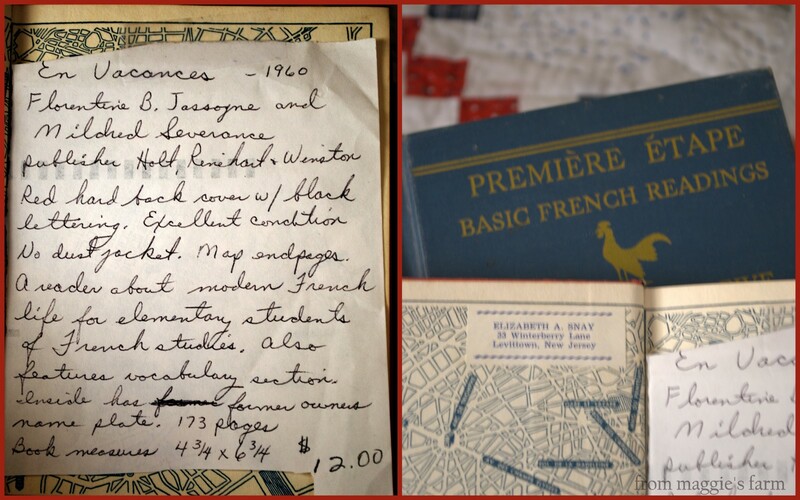 Bottom: Two French Grammar books--$2, each. !!!!! 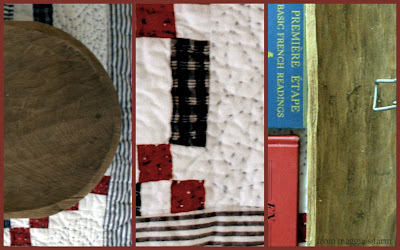 And under it all, a hand-pieced quilted sham, in the colors of the French flag (and our's too! ), no less, $4. !!!!!! It was the best morning of thrifting ever! That is, until the next morning of thrifting, probably. Well, it was an EXCELLENT day of thrifting, no doubt! 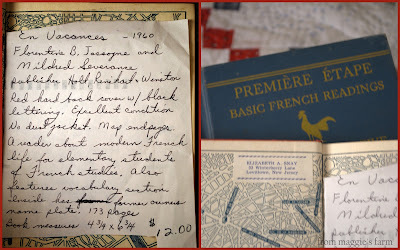 How in the world did your little French book wind up in the Burnet Library Thrift Store? Now, more about this little baby. This is really something. It's really something because, this, this little book, with the little nameplate on the inside cover, this is inspiration, my friend! This just became my next writing project. I'll keep you posted on that. It's only been in the past few years that I've been successfully roasting chickens. I was not a great cook. Couple my lack of skill with the practices of commercial chicken production which tends towards huge, Stepford-perfect chickens, that taste less and less like the chicken of my childhood, and there you have it. A perfect storm of chicken-roasting failure. But I, (and those who eat my chicken, probably) am happy to report that I have conquered this bird-roasting stuff. And below, an example of the results. As to the turnaround? Two things. First, starting with a real bird. Used to....chicken was smaller, and so were we. Hmm. Coincidence? Well, I'm no scientist, and I'm not about preaching to you on food policy here. 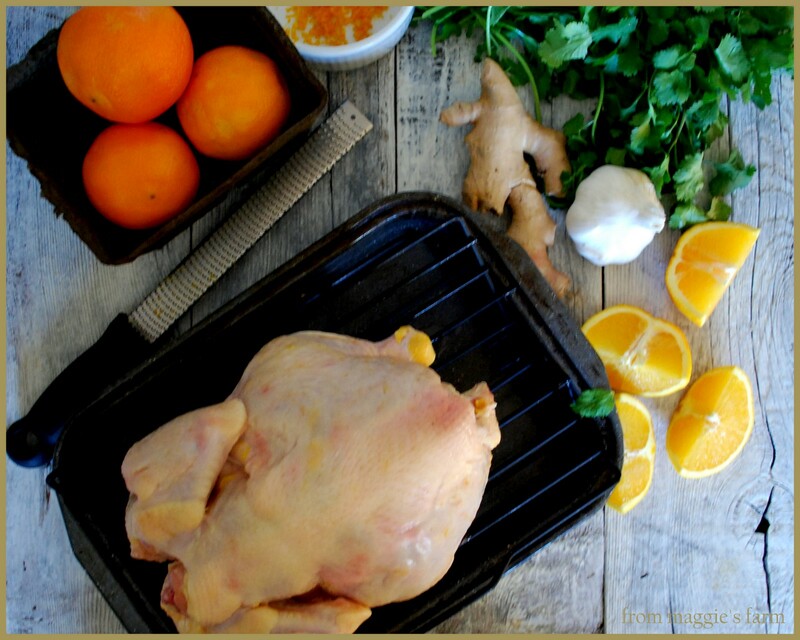 Whatever you may feel about the organic food movement, I invite you to compare the two chickens, and simply let your tastebuds make the decision. The bird we've chosen reminds me why chicken used to be my favorite food. You've heard me go on about this before, so I'll spare you. It's just hard to not go on about one of the most important skills I've picked up in the last few years. It's changed our chicken-loathing selves into chicken-believers! And our turkeys, well, lots of grief has been spared since we began brining those sweet turkeys, and the dry bird of days past, well, is past. Chinese New Year is observed with its own unique set of customs and traditions. Serving this chicken whole represents one of those customs. Fish and chicken are symbolic of prosperity. It should always be presented as a whole, as it is inauspicious to cut them into pieces, which is a metaphor for having your prosperity 'cut'. 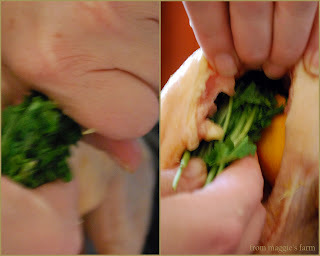 In fact, in most homes and restaurants, the chicken is presented with head and feet attached. Though whole fish is not uncommon to see in our own culture, with all due respect, we chose to honor the tradition, give a nod to custom, but eschew the common presentation. Now that said, If you find us, often this year, running around like a chicken with it's head cut off, well, we'll reconsider next year. 好運和繁榮！Kung hei fat choi! Luck and prosperity! 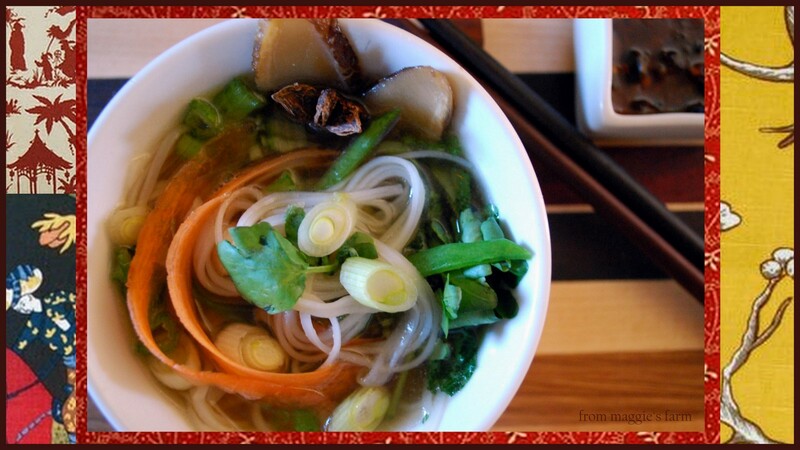 The first day of the Lunar New Year and we're off to a healthy and traditional start with this simple twist on Buddha's Delight, also called Jai Soup or Lo Han Jai, the meal commonly shared in many regions in China. The Chinese New Year, or Lunar New Year, is celebrated, much like our own traditional celebrations, in unique regional ways. One tradition, common to all regions, is to eat no meat on the first day of the year. Many regions observe that ritual with this hearty bowl of vegetarian soup, brimming with foods that are thought to bring fertility, prosperity, and luck, throughout the year. As you've seen by following the links above, they can have quite an extensive list of ingredients, of which many of are exotic and difficult to find in our small-town supermarket. If you have the luxury of living close to an Asian market, you will find most of those ingredients on the shelves, albeit a bit difficult to spot if your Chinese is rusty. We've given a nod to the tradition, keeping all of the vegetarian health benefits, but trimming the ingredient list to include a few of the more common ingredients, and less of those more difficult to find. We haven't sacrificed the fresh flavors one little bit. 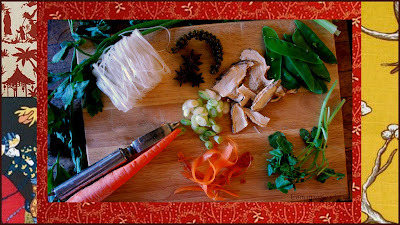 From top left, clockwise, we've included chinese celery, rice noodles, star anise, green peppercorns, snow peas, watercress, carrot, scallions, and dried mushrooms (these are black mushrooms, or more commonly, here, shitakes). Begin with a hearty stock. While chicken, seafood, or even pho stock would all work beautifully, we used a vegetable stock in keeping with vegetarian/vegan principles. We simmered the stock with the star anise, green peppercorns, (you could substitute black peppercorns, but be sure to remove them prior to ladling over ingredients) and a pinch of grated ginger (not shown). Prepare no less than one cup per serving. Meanwhile, we minced 2-3 stalks of chinese celery, leaves and all. 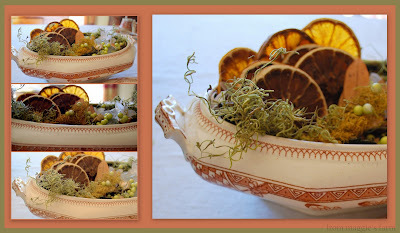 (You could substitute one large stalk of traditional celery, including the leaves). We sliced a handful of snow peas lengthwise, trimmed about a handful of watercress, leaving most of the stems behind, shaved curls from one medium carrot, sliced mostly the white part of 2 scallions on the diagonal, and reconstituted a handful of dried mushrooms for 30 minutes, drained, and squeezed the moisture from them, and trimmed a few of the larger ones into bite-sized pieces. Toss the rice noodles in a bowl of warm water, according to package directions. Ingredient Notes: Feel free to add or subtract from the vegetables above, to your own liking, or for that which is more commonly available. Refer to the links above for more ideas. Don't be intimidated by all those odd sounding ingredients and sauces. Follow the links to find what they look like, where you can find them, or what you might substitute for similar results. Don't be shy about picking up a few new things to try, most of the sauces stay fresh in the fridge for ages, and the veggies are great alone, in a salad, as a snack, or in a soup all by themselves. Live a little! Eat outside the box! After stock has simmered for 30 minutes, remove the star anise, and the peppercorns if using black, or if the green ones may be too peppery for your taste (I leave them in! ), and bring to a rolling boil. Place all of the vegetables in a colander or strainer and set atop the boiling pot of stock, to steam for no more than 5 minutes. I like about 3 minutes, to keep the veggies crisp. In individual bowls, divide rice noodles and vegetables, and ladle hot stock over all. Serve with condiments such as soy or tamari sauce, sriracha sauce, or as shown, a sauce of hot chili oil and Ponzu, for those with a hankering for all things spicy. 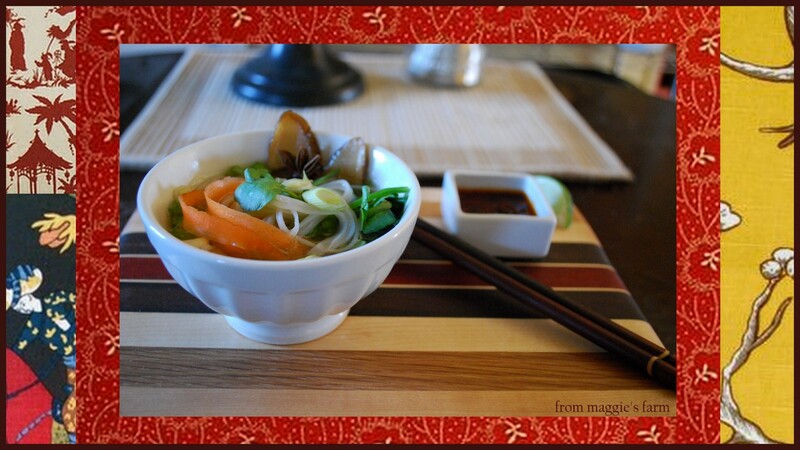 I got those fancy chopsticks for Christmas, cause Santa knows what I like, and I love eating with them! I eat all of my noodles and veggies with them, then drink the broth straight out of the bowl. And then I feel healthy, and lucky, and prosperous, and ready for the New Year! And you will, too! Across China and around the world, people are celebrating the Lunar New Year and the advent of the Year of the Dragon. Five filmmakers captured the spirit and sparkle of the celebrations in Beijing. Kung hei fat choi! “Luck and prosperity!” is the customary greeting during Chinese New Year, a celebration that lasts from the new moon, or lunar new year, to the Lantern Festival 15 days later. Chicken: Representing happiness and marriage. 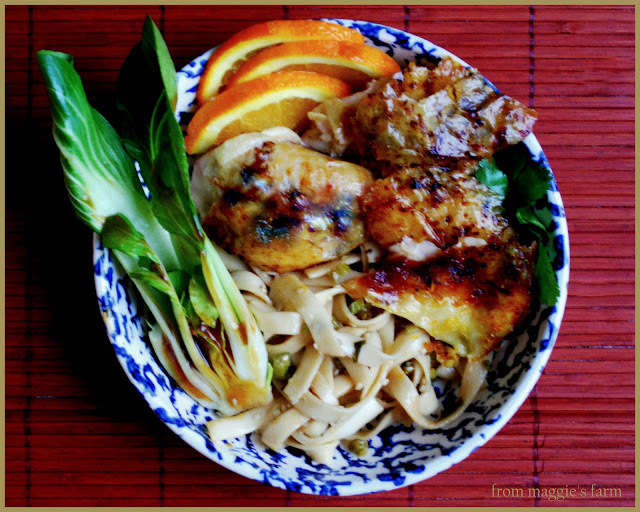 Chinese garlic chives, Noodles, and Peanuts: Long life. Oranges, bamboo shoots, and dumplings: Wealth. 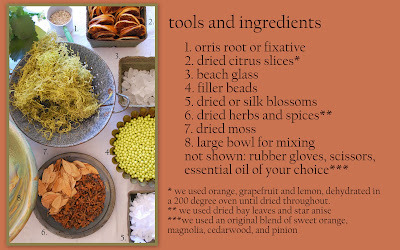 We'll enjoy sharing recipes with these ingredients, and many more, over the next two weeks. It is tradition during this time to reconcile, forget all grudges and sincerely wish peace and happiness for everyone. Late Thursday morning, Molly greeted me eagerly with what looked to be one of her precious 'finds' in her mouth. On those occasions when she's managed to find a hole in the fence, and gone on her mysterious overnight walkabouts, she'd managed to proudly accrue and present for our pleasure an old purse, bones so large I'd swear there's a body out there, a less than fully decomposed cat carcass (thank you, Molly. Really, you didn't have to. ), a fish head, deer antlers, t-shirts, steak seasoning, a scrub brush, several stuffed incarnations of Woody, from the movie Toy Story, a jar of peanut butter, and one, pristine, unopened, bag of pork rinds. Of which she was the most proud. We struggle, as proper pet parents should, to keep her within the confines of our own rural property. And all day long, she's compliant. It's only occasionally that her will to wander is greater than her desire to behave. Abandoned properties, and their remains of a livelier time, beckon in the night. They are ripe for the scavenging, a veritable gold mine of discards, and on occasion, the call is unrelenting. A dog's gotta do what a dog's gotta do. As long as she's not caught. So it was no surprise to find that Molly had unearthed some dirty, foreign, unrecognizable object on this bright and beautiful morning. However upon closer inspection, because she was insistent that I see what she had so proudly collected for me, it appeared that this was no ordinary scavenge. This, almost imperceptibly, was moving. And what Molly had, draped delicately in the loose grip of her jaw, was, to her, an obvious treasure. 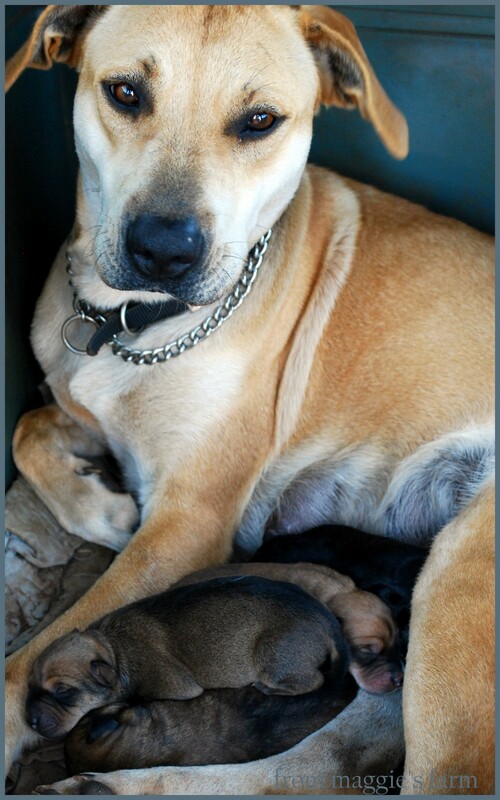 It was a newborn puppy. 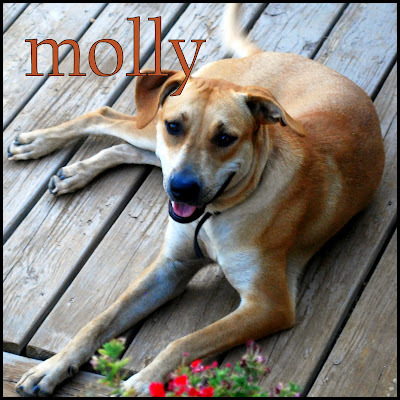 It was Molly's puppy! Now lest you think we're totally thick and unaware, this did not come as a complete surprise. Days before, evidence of expectancy had become apparent. Her body had taken on certain maternal qualities. She had excavated a hole large enough to hunker her lanky body into so that all you saw from the front windows was her big smiling head. She was clearly organizing her surroundings for something. It could have been that she was readying herself for the end times. She listens to the local station that blares from speakers of a home faraway You never know what dogs might pick up from the media. Perhaps she was planning to stock her larder for days of certain doom. Or it could have been, just maybe, that Molly was preparing for a special arrival. Birth. It's an utter miracle of nature that an animal that seems to be heretofore utterly oblivious to all but food, bones, squirrels, and their owners' adoration, know exactly what to do when the time arrives. 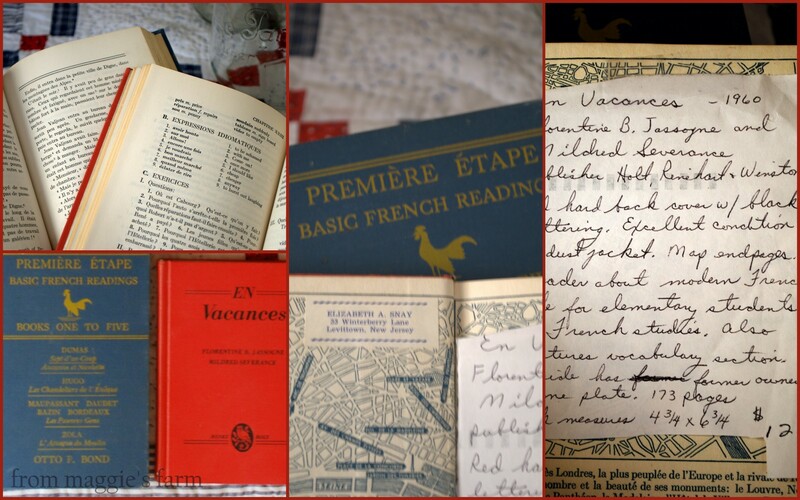 There is no nervous fumbling for a prepacked suitcase, the drama of oh-my-heaven's-the-time-is-here!, the tattered and doggy-eared copy of What to Expect when You're Expecting and the stack of similar titles on the nightstand. They know exactly what to do. And experience has told me that I know exactly what I should do. And that is nothing. Standby. That's all they need. The lessons I've learned on this farm are that nature knows what to do. And in all of my well-meaning, book-studying, internet-researching, discussion board-consulting ways, I really do not. My job is to be on standby. Monitor for signs of stress. Don't touch anything. Don't interrupt. Take pictures unobtrusively, if I must. Stay calm. Offer few, quiet words of encouragement. Let nature take it's course. So, yes, I freaked a little at seeing this little limp bundle of fur in Molly's mouth. And, yes, I ignored my own wisdom just set forth and tried as I might to encourage Molly to 'drop it' into my hand. And no, there was nothing doing. 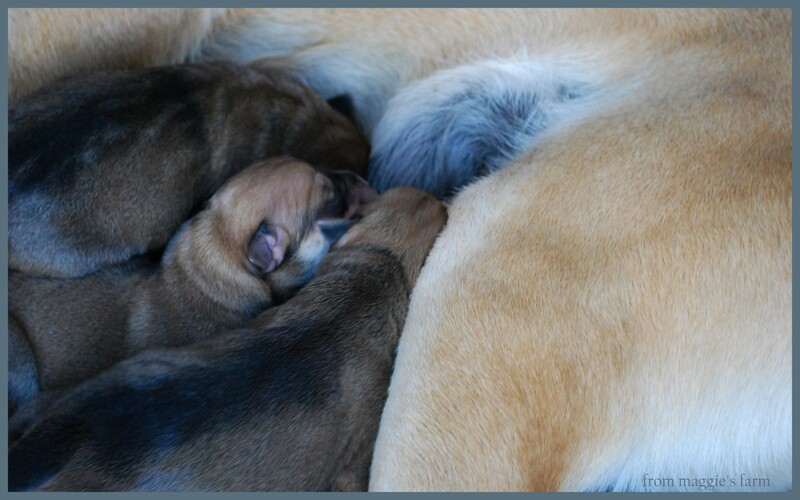 But she would accompany me back to her 'birthing pit', where I left her to tend to what had to be a puppy just minutes old. It amazes me still that she knows to lick the puppy's face first, to sever the cord, to remove the cloak of birth, to gently nudge it to her body, to understand how to nurse, to await the next arrival. I gave her head a gentle and reassuring pat. I beamed. I marveled at the intelligence of our natural world. This is no mere coincidence. This does not occur as a result of chaos. I am overcome with awe by the detail God has put into each and every creature. 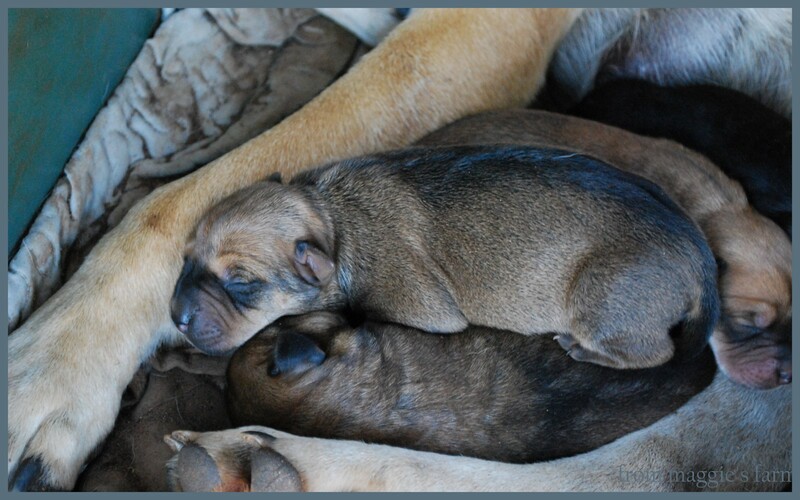 Because if you question your belief in God, maybe you ought to have some puppies. Postscript: I realize that I stand the risk of being branded politically incorrect by both mentioning God, and allowing my dog to become pregnant. !!!!! 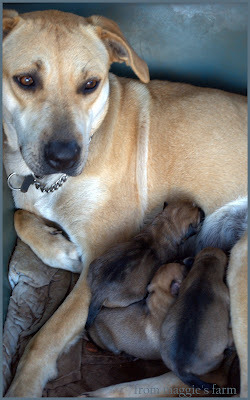 While it was an unplanned pregnancy, we are happy that she has had a healthy litter, and will now be able reschedule her spaying when her puppies are weaned. We believe in responsible pet ownership, spaying and neutering, and adopting orphaned pets, as all of ours have been. As for mentioning God. Yeah. I did that. 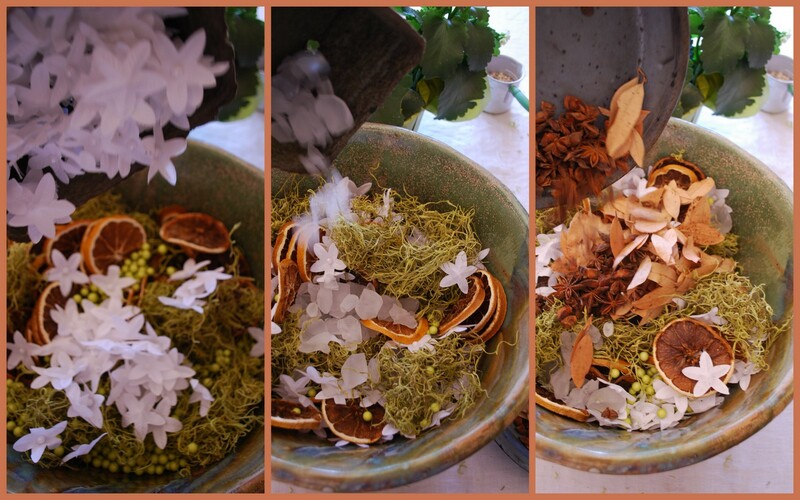 So many of us are focused on turning over a new leaf during this first month of the year, so what better way than to incorporate a few new leaves. While the good ole iceberg standby (with one shred of carrot, one shred of red cabbage, one slice of woody radish, and a heapin' helpin' of ranch, blue cheese, thousand island, or french dressing) has it's place firmly entrenched in the lexicon of culinary comfort, the healthiest options, those that give the greatest nutritional bang for your buck so to speak, are the greenest. The darker the green, the greater the nutrient profile. This salad starts with a base of dark green, seasonal lettuces; baby spinach, and one of my favorites, arugula. My homegrown arugula can be a bit strong, and overpowering for some of the more delicate ingredients (though a bowlful with a light vinaigrette, topped with crumbles of goat cheese, and a few toasted nuts is about my favorite quick way to gobble down some greens), so blending with the milder baby spinach evens the punch, without compromising nutrients. Our salad is dressed with seasonal sunny citrus, in a natural partnership with some bright Asian flavors, perfect for ushering in our celebration of the Chinese New Year, which begins on January 23rd. I think you'll enjoy the marriage. equal handfuls of spinach and arugula, harder stems removed, rinsed in cold water several times, and dried with clean toweling. As always, these are guidelines--certainly adjust to suit your taste. Love ginger? Add lots more. Working closely with others? Maybe watch the garlic. Have a bit of a sweet tooth? Ramp up the juice, the zest, and/or the honey. Like things a bit spicier? 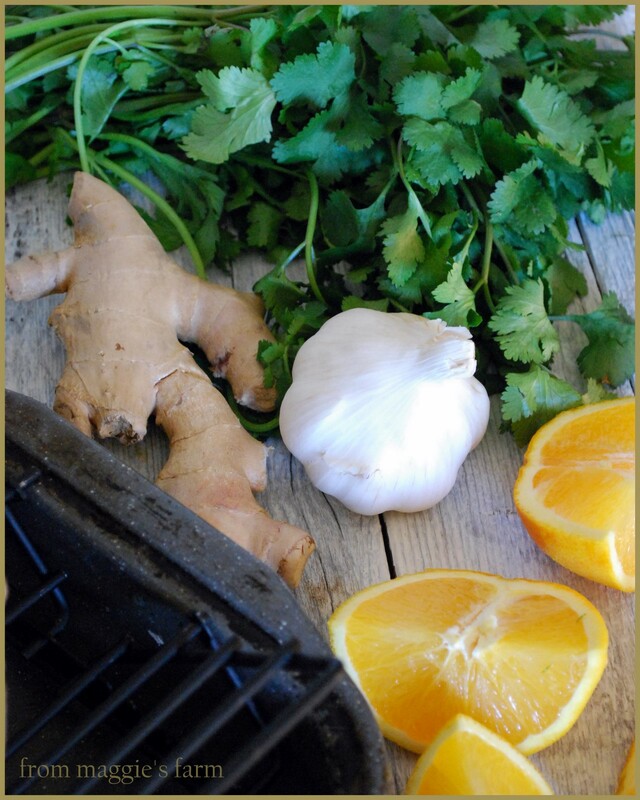 The mustard, ginger, garlic, and cayenne can all be adjusted for a little extra 'pep in your step'. You might even take a walk on the wild side and experiment with grapefruit instead of , or combined with orange. This is YOUR salad. 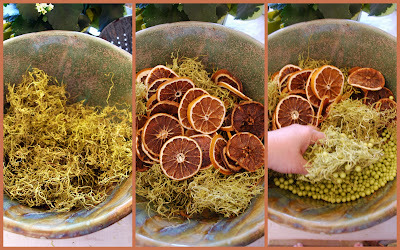 After zesting both oranges (with either a zester, or the finest side of a grater), pare peeling from orange, going deep enough to remove the white pith of the orange. Slice off the odd end, if using a naval orange. Over a bowl, to catch the juice, (and you can count on this being a juicy mess) and with a sharp paring knife, slice down on the side of each membrane, making a V cut to free each segment. 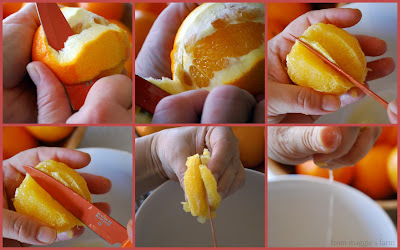 Continue around the circumference of the orange until you have 'supremed' each segment, then squeeze the juice from the remaining membrane left. You've just supremed your fruit. 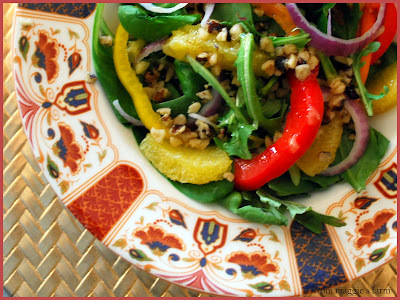 Toss segmented oranges with spinach, arugula, red onion, and sweet pepper. Set aside to dress. To the bowl of orange zest and juice, add mustard, honey, ginger, shallot, and garlic and combine well. 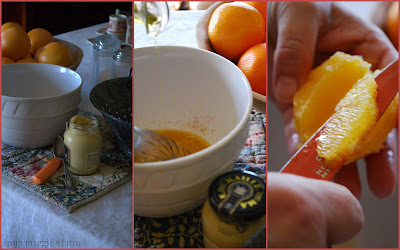 Slowly drizzle in neutral oil, whisking all the while in order to emulsify the dressing. 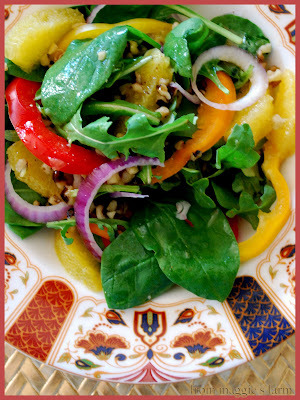 Your dressing will be well combined, instead of simply a container of oil and liquid, separated. After all of your neutral oil is assimilated, slowly add toasted sesame oil. Taste, and correct seasonings. Add assembled salad and toss to coat. 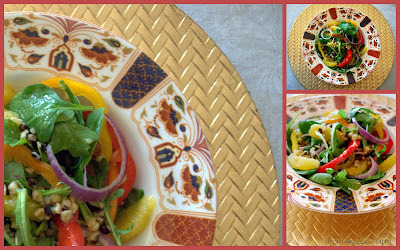 Plate, top with toasted walnuts, and serve. We'll be doubling our recipe for the vinaigrette to use in our Orange Sesame Roasted Chicken this weekend. Come back and see us, and we'll show you how it's done. And have a great weekend! When I was a little girl, it was always a great thrill to go to ladies events with my mother. I'd have polished shoes and lacy white anklets and a perfectly starched dress, likely homemade, but never looking it. My mother would comb my hair into taut doggy ears, with ne'er a hair out of place, and matching bows would be somehow cemented onto my scalp such that they wouldn't budge under threat of a typhoon. I was lectured all the way there, to stay still, and silent, and ladylike. I was not to speak unless spoken to. I should avoid acting too clever. And I was not to overdo it on the punch. Those who know me know that staying still, silent and ladylike were marching orders that I, much to the chagrin of my mother, was not born to follow. Not speaking unless spoken to confounded me because I had so much to say. Couldn't imagine what was meant by acting too clever, because how clever is too clever? Is there such a thing? Oh I loved the pretty crystal cups, the crisp linens, the best china, the petite silver spoons, the delicate cookies, the sugary pastel cake frosting, the salty goodness of mixed nuts, the magical melt-in-your-mouth buttermints. But the love. of. my. life. was PUNCH. Punch with sherbet, punch with ice rings, punch with little frozen grapes, punch with pineapple juice, punch with ginger ale, punch with lemon lime soda, punch with anything. I loved, and still love, punch. We had a gathering of some of my favorite women at our church last weekend, and I, delightfully, was in charge of breakfast. They thought it was because I was being generous. But it wasn't. It was because I don't get to play hostess for ladies events nearly enough! We had green chile egg puff with lots of gooey cheese, little cocktail smoked sausages in jezebel sauce, mixed berries in honeyed vanilla dressing...and, naturally, the best part, PUNCH! one pint fat free half and half, all chilled. Except I made four times that amount. We drank about the quantity, above, along with coffee, for the women's breakfast of about twenty. We drank the rest at home. 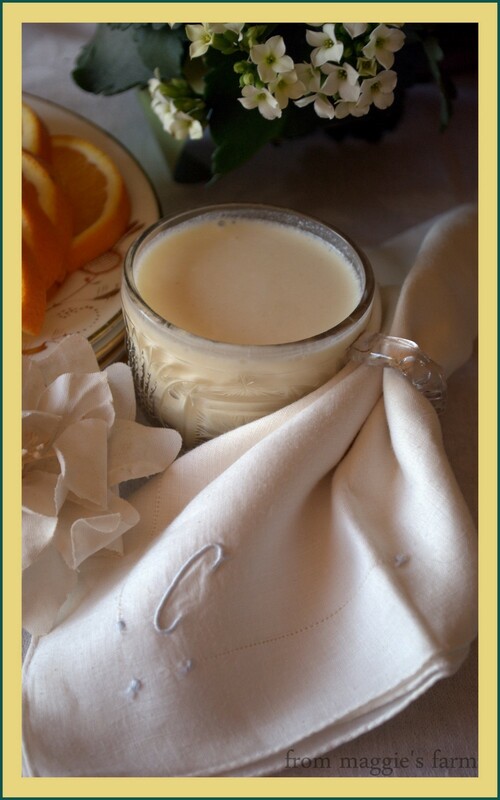 I cannot say whether it would be good with champagne, or perhaps vodka. Because this is for church, people! What we drank at home shall remain undocumented. 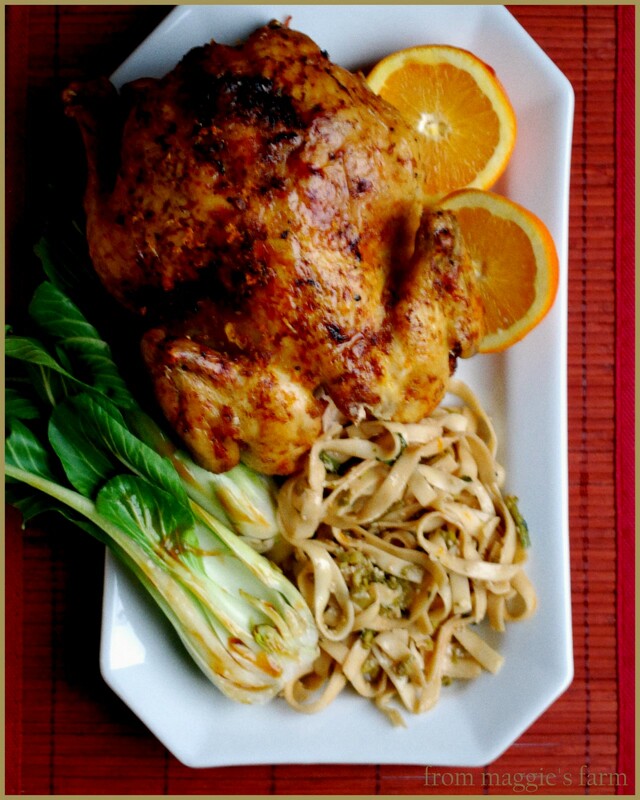 Join us tomorrow as we prepare to celebrate the Chinese New Year, on Freestyle Friday, Notes From Maggie's Farm. See you then! and adding 10 drops of essential oil between components. Won't these make thoughtful hostess gifts --both useful and beautiful, and easy on the pocketbook, too. Have fun putting your individual touch on this project by varying ingredients, fragrances, and herbs and spices to create a signature scent for your own home, and perhaps tie a pretty little ribbon around a few extra bagsful, because your guests will likely clamor for a little aromatic package, themselves. A simple way to load your dishes with loads of flavor, infused oils are easy, and fun, to make. 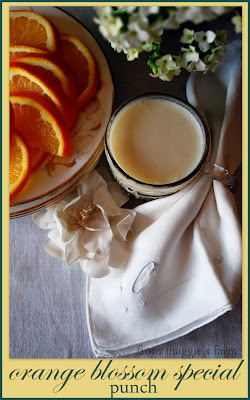 For this rosemary orange infused olive oil, we've used fresh rosemary, which has been washed, and allowed to air dry, and a long curl of orange peel, with white pith removed. 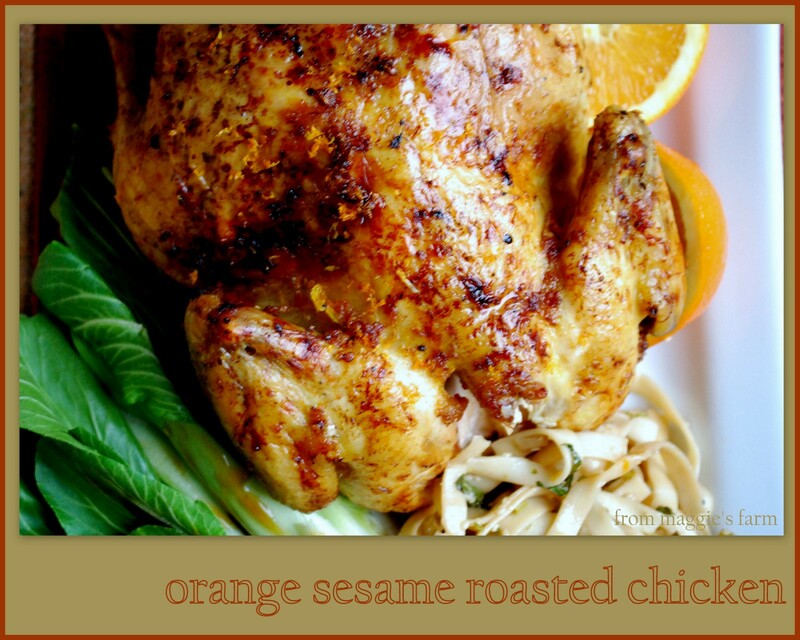 Combine in an oven-proof bowl of pure olive oil, and heat slowly in a 250 degree oven for 2 hours, or until the aromas of rosemary and orange heavenly ensconce your entire kitchen, and beyond. 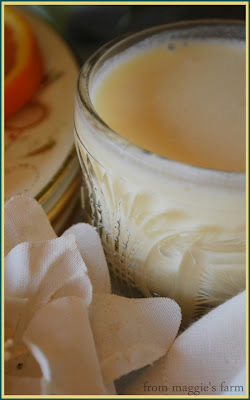 Remove oil and allow to cool slightly, still warm, but able to handle safely. 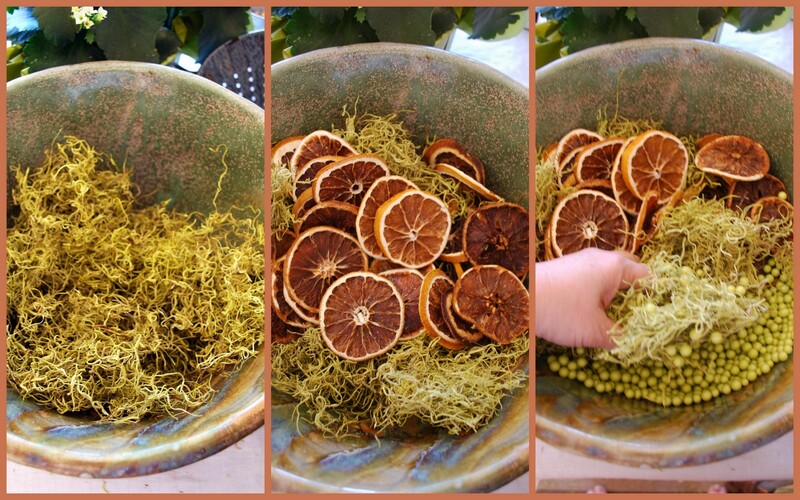 Discard herbs and orange peel. Load fresh herbs and peel (which have been well-washed and allowed to air dry) in bottle of your choice. 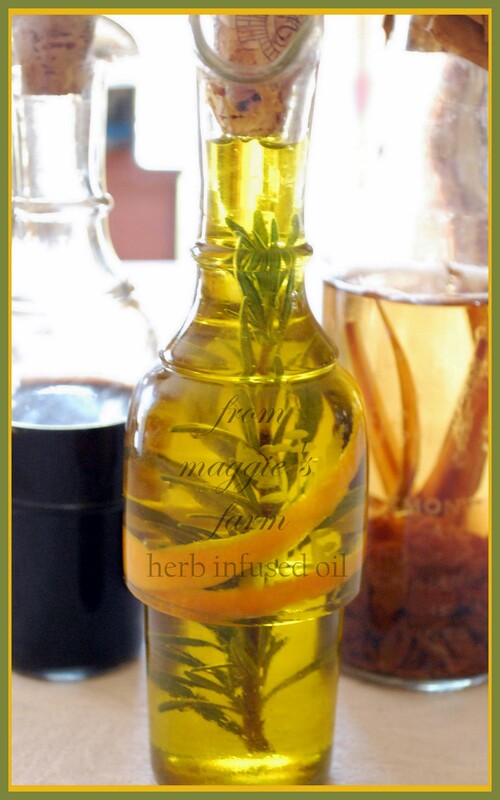 Pour oil over herbs in bottle. Allow to cool further to room temperature. Refrigerate. 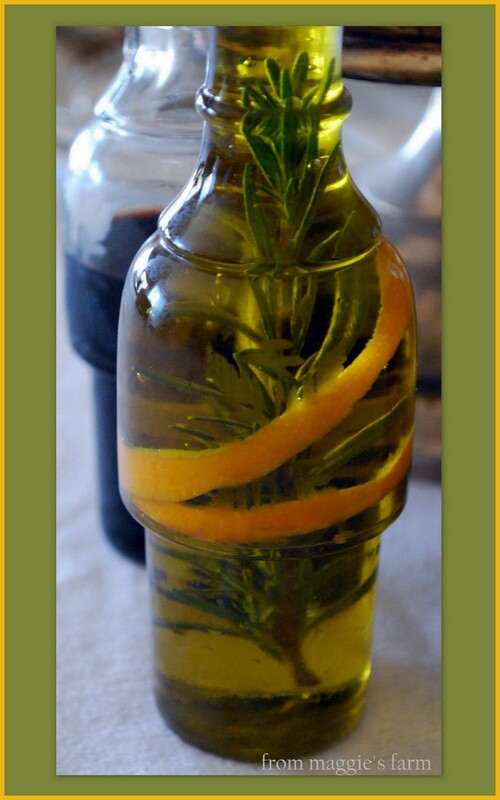 Remove from refrigerator 30 minutes prior to using, as olive oil will harden when chilled. Use within 7-10 days. Infused oils are safe, too, if you follow just a few guidelines. Refrigerate after opening. Why? Botulism. Botulism can flourish in any anaerobic condition, and introducing moisture to oil makes for a friendly environment for bacteria. In other words, infused oils are perishable and must be refrigerated. Use any oils that have water-based ingredients (like garlic,ginger, citrus peels, etc...) within a week. 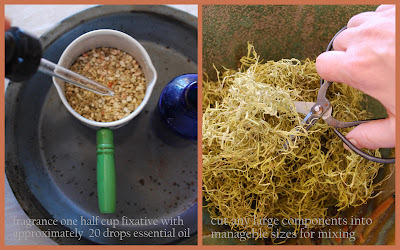 While there are methods and ingredients that will prolong the life of oils infused with dry ingredients, (such as herbs, alone) lasting far beyond, and some suggest almost indefinitely, if refrigerated, to be on the safe side, we recommend making small amounts, and using within four weeks. I, too, have seen those lovely pictures of herbal concoctions all lined up upon a windowsill with the sun's rays illuminating them from behind. So pretty, and so not edible. All infused oils should be refrigerated unless used for decorative purposes, only. 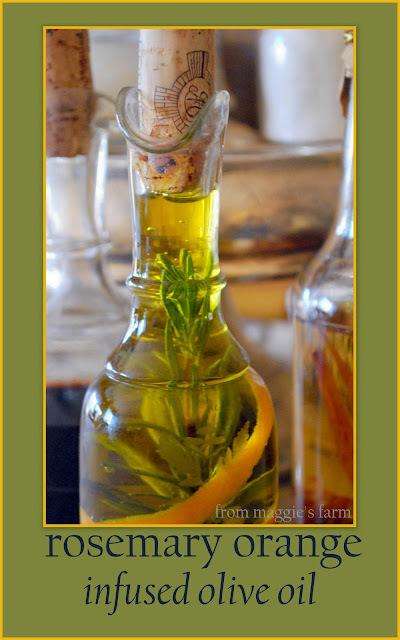 Coming this spring, from maggie's farm will offer herb-infused oils and vinegars. More news, soon!